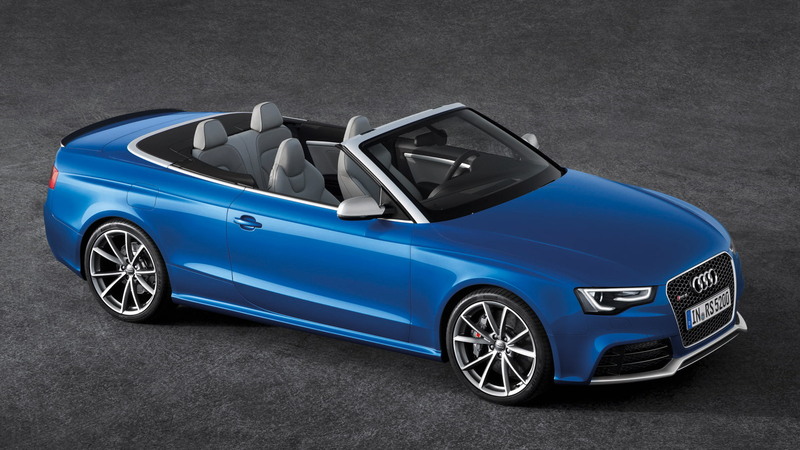 The Audi RS 5 has just gone on sale, and we’ve even had a chance to drive one, but now the covers have come off a new convertible version, which will be presented to the public for the first time at the 2012 Paris Auto Show this month. Combining brute performance with an elegant convertible body, the new Audi RS 5 Cabriolet is sure to be one of the most sought after drop-tops around when it arrives next year. The drivetrain package is identical to that of the RS 5 coupe, with power coming from a naturally-aspirated 4.2-liter V-8 rated at 450 horsepower and 317 pound-feet of torque. Drive is sent to a standard quattro all-wheel drive system via a seven-speed S tronic dual-clutch transmission, the only gearbox available on the RS 5 line, and in its most potent setting the new RS 5 Cabrio will rocket from 0-60 mph in 4.9 seconds. That’s slightly off the pace of the coupe’s 4.5 seconds, though this is understandable given the convertible’s slightly heavier mass, due to extra strengthening of the body required by the missing roof. According to Audi each of the car’s 450 horses has around 9.41 pounds to lug around. Top speed is 174 mph, which is the same as in the coupe. 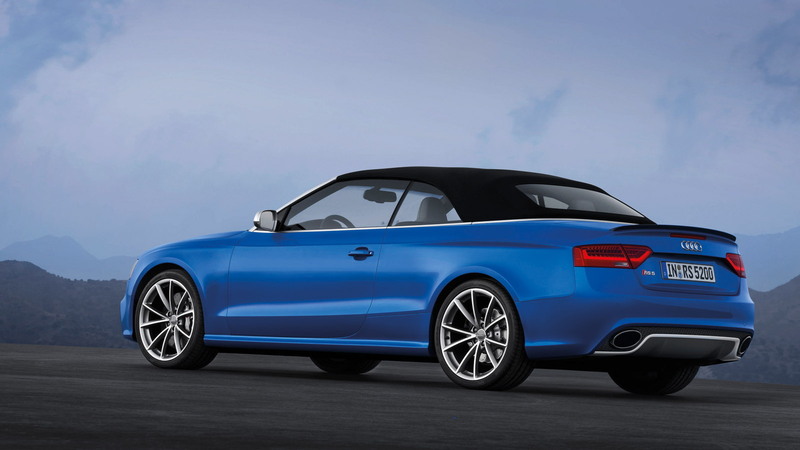 Like its more mundane A5 and S5 Cabrio siblings, the RS 5 Cabrio makes do with an automated folding soft-top. This spans a well-appointed four-seat cabin and can be lowered in just 15 seconds, even when driving at speeds of up to 31 mph. 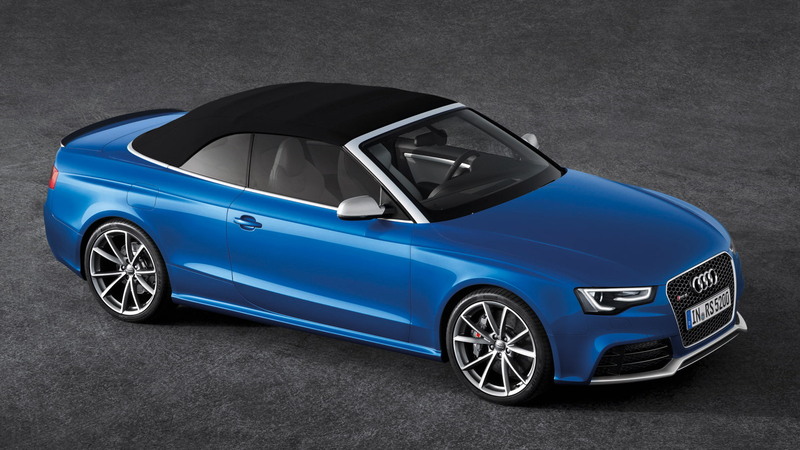 By going with a conventional soft-top design, the RS 5 Cabrio only loses around 2.12 cubic feet of trunk space with the roof down. Raise this, and trunk space measures in at 13.42 cubic feet. Additionally, the split rear seatbacks can be folded for extra storage, and a load-through opening is available for those longer items. Though the car is one of the most luxurious to be had this side of a $100k, the real highlight is what’s residing underneath the pretty sheet metal. Starting with the quattro all-wheel drive system, this features a compact and lightweight crown-gear center differential that can vary the distribution of torque between the front and rear axles quickly and over a wide range--up to 70 percent to the front and up to 85 percent to the rear, as necessary. The default is a 40:60 front to rear split. Note, the crown-gear center differential works together with an additional torque vectoring system, which acts on all four wheels. If the load on the inside wheel is reduced too much, that wheel is braked slightly before it can begin to slip. If that’s not enough, Audi also offers its sport differential as an option. This feature actively distributes the power between the rear wheels via two superposition stages. Another highlight worth mentioning is the Audi drive select feature, which enables the driver to vary the characteristics of the electric power steering, seven-speed S tronic dual-clutch gearbox, throttle valves, and even the exhaust system sound flaps. There are three different modes to choose from: comfort, auto and dynamic. Cars equipped with Audi's MMI navigation plus system has an additional mode, “individual,” which allows custom settings. But it doesn’t end there. Audi drive select also lets you play around with the suspension settings. 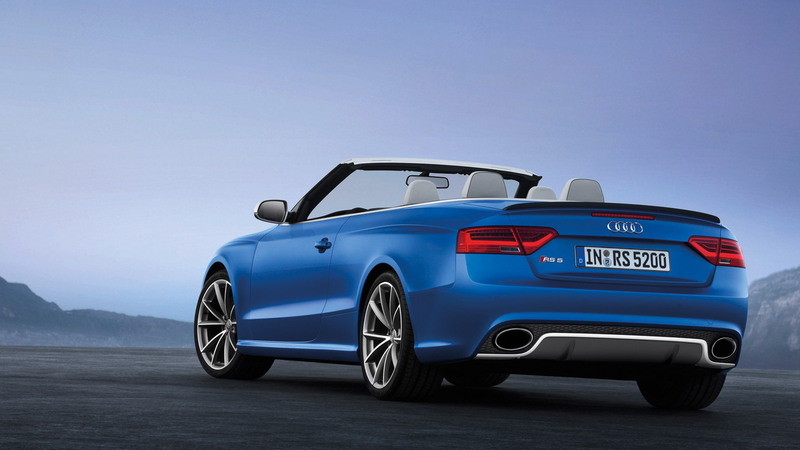 In the RS 5 Cabrio, each pair of diagonally opposing shock absorbers is interconnected via hydraulic oil lines and a central valve; when cornering at speed, the system increases support of the spring-deflected front wheel at the outside of the curve. Audi drive select lets you adjust the severity of the system, once again on three different levels. Standard brakes are ventilated steel discs, with lighter carbon ceramic units remaining an option. They reside within 19-inch forged aluminum wheels as standard, with 20-inch units available. As for luxury amenities, these include a parking assistant, heated seats, three-zone climate control, and a suite of infotainment goodies. At the very top there is the aforementioned MMI navigation plus, which includes a large hard drive, DVD drive and seven-inch color monitor. Opt for Audi connect and your car becomes a rolling Internet hotspot. More options include a carbon design package for the dash and surrounding areas, a host of safety warning systems, and a Bang & Olufsen stereo. 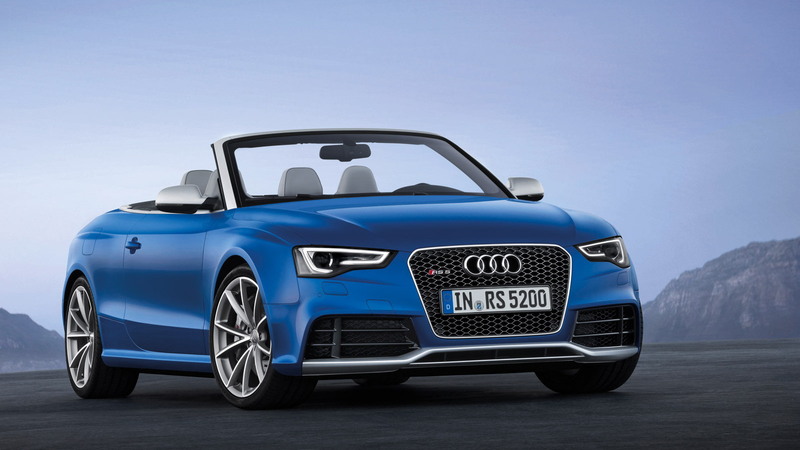 First sales of the 2014 Audi RS 5 Cabriolet begin in Europe early next year, and with any luck the cars will be on sale in local showrooms in time for summer.